We have a package to suit every occasion. And if we don't, we can build you a custom wedding package to make your day even more special. If you’d like more information about wedding packages at First Landing we can help answer all of your questions. 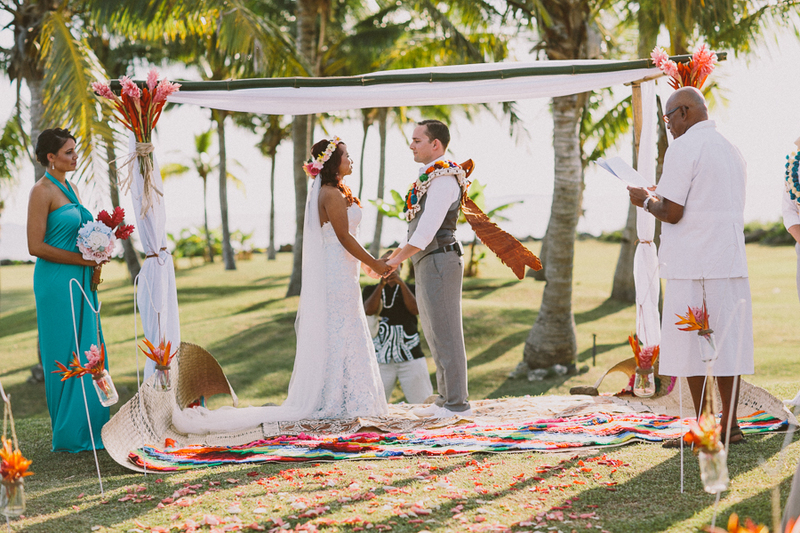 Here’s some of the Fiji wedding package frequently asked questions. If you have a question that isn’t answered below, just contact us and we’ll get back to you straight away. Do you have an in-house event and functions co-ordinator? Yes, we have a full time in –house wedding co-ordinator and team to service all your wedding needs. Will there be other weddings on at the same time? No. Your special time is yours and yours only however, there may be other weddings performed on the same day at different times or locations. A local celebrant or minister will come to the resort to perform your ceremony. If there are no witnesses available, these will be provided by the resort. What about special touches that will wow”my guests? We offer several finishing touches that will make your day extra special – examples include fireworks, a bonfire, and island day cruises. Ask the wedding coordinator for more details. Are setup costs included in the package? No, all weddings are individual as are the themes. Our wedding packages include simple wedding ceremony costs only. Please contact our wedding co-ordinator for further information. Do we need to meet prior to the wedding? It is anticipated (not essential ) that you may need about one hour in total onsite to familiarize yourself with the property along with our style of operation. We can always be contacted by email or phone (office hours preferable) should you require more on site meetings other than the above. The wedding ceremony and reception can be moved indoors to the Mai Kana Restaurant. For images please contact our wedding coordinator. Restaurants close to the outdoor venue are also used as back up plans for receptions. What flowers are available locally? We work with a local flower grower who offers a wide selection of flowers including – birds of paradise, red and light pink gingers and other varieties of tropical flowers. Orchids and frangipanis are seasonal and we do have an array of “life like” flowers so please ask our wedding co-ordinator for advice. There are several options available for live music including a live band, our in-house serenaders, our in-house Dj or a contracted DJ. Contact the wedding coordinator for details and pricing. Will someone be able to steam my dress? We have a dedicated member of our laundry staff that can assist you. If your wedding party wants to iron/steam their outfits, our staff can prepare their garments as well.